ABOUT THIS INTERVIEW: Following six weeks of filming their first feature film, April 26th marked the Beatles long-awaited return to the concert stage in Britain. 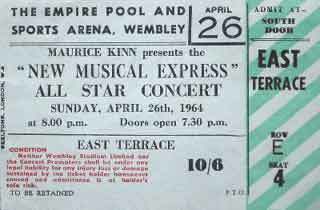 It was on this date that the Beatles topped the bill for the New Musical Express Poll-Winners' Concert. John Lennon and Ringo Starr were interviewed backstage at Wembley Sports Arena by Gene Loving just before the Beatles' performance. Q: "John, I understand you just finished the movie." Q: "'A LONG Day's Night'?" JOHN: "'A Hard Day's Night.'" Q: "I thought George was joking last night when he said the title of the movie because you always joke around, but this is the true title?" JOHN: "That's the title, yeah." Q: "Of all the songs that you all have recorded, which one do you like the best?" JOHN: "I don't know. I normally like the one we've just recorded." JOHN: "Well, the last one we did was the title song from the film. Well, you know, that's the one I normally like best." Q: "Whichever one happens to be the latest one out?" JOHN: "Yeah, well, It's the newest one, you know. It's sort of new to ya, so ya like it best." Q: "I understand that your group, or you and Paul personally have been given a great reward because of your writing skills." JOHN: "What kind of reward? Money?" Q: "You've gotten quite a bit of money, but you were given an award for being a couple of the best writers in the world, weren't you?" JOHN: "Oh yeah, that's right. Well, we couldn't be there, somebody took it for us, I remember. Ivor Novello Award, I think it was." Q: "Alot of the fans are always calling and asking about your automobiles and what kind of cars you drive. Do you drive at all?" JOHN: "No, I don't drive anything. I don't need one, you know." JOHN: "Well I mean, I'd never get a chance to use it. I'll get one when I'm older." Q: Ringo, do you have a drummer that you like to look up to that you watch?" RINGO: "No, not really. I like most of them, you know. There's no special one. I've never followed them, anyway. I just keep playing." Q: "The show that we're seeing right now, here at Wembley, is something unusual. It features just about all the top stars in England and in Britain. How do you feel about playing on a show with so many other stars? Usually, you all do personal concerts, don't you?" RINGO: "Yeah, well, even when we do a tour there's always some other stars on anyway. But we're a bit nervous, you know. It's the first time we've played for two months, with making a film and everything. So we hope it goes alright. You feel better once you're on, though, you know." Q: "What about your return to the US? Do you look forward to it?" RINGO: "Yeah, I can't wait! (excitedly) Wooo!!!" Q: "You enjoyed it before?" RINGO: "Yeah, it was marvelous, you know-- loved it. Fantastic time." Q: "I hope that you can make it to Tidewater. We've put in a bid for the tour when it comes back. About fifteen dates have been booked so far, and about ten more are left, so good luck. You have about twenty-five shows in thirty days." RINGO: "The best part about this tour is that we see more of the States than last time 'cuz we only went to Washington, New York, and Miami. So it's good that we'll see alot more." Q: "In America, there are many, many, many recording stars. Do you have any favorite recording star or group in the US?" RINGO: "Oh there's millions, you know-- The Impressions, and The Shirelles. All of them, you know. Hundreds of them. You just can't name 'em all." Q: "I have around five hundred letters that came in one weekend for The Beatles to the radio station. People write and ask questions, and of course I have no way of answering without knowing. They ask things like favorite foods of the Beatles. Do you have anything special if all of you went out to eat at once?" RINGO: "We eat steak usually if we go out. Steak and chips. Egg and chips. Beans. Bacon. Chicken." Q: "Do you all eat regularly?" RINGO: "Sometimes. Some days we eat regularly, and some days we have a meal a day, or two meals a day, you know." Q: "For recreation, how can someone as famous as a member of the Beatles possibly be able to go out and do what the average person does?" RINGO: "We don't go out, you know, and do what the average person does. We have to stay in, or if we're off-- we stay in all day anyway and just play records, or when the TV starts we put that on, or you know, we just amuse ourselves. But we can go out and about. In London there's about three clubs we can go to where it's okay for us to go. It's like show-biz clubs, you know." Q: "Bill Corbett your chauffeur, last night, drove us in from the airport. He was pointing out a theatre where the movie will be previewed, and he told us something I guess would be a great, great honor for anyone, and that is the fact that the Queen will be attending the premiere." RINGO: "No, the Queen isn't attending." RINGO: "He's got it wrong. It's Princess Margaret." Q: "Okay, I'm glad you straightened that out." Q: "Well good luck on getting into the theatre that night." RINGO: "Well it's not up to... You know, the police will fix it up. They'll have some idea what's happening." Q: "There are ten thousand people in this auditorium right now. There must be another ten thousand outside. What is the story on your police escorts?" RINGO: "We just came in a small van, you know-- boarded up. and we just drove in like workers. We just sat in the back and the police drove us in, in plain clothes." Q: "We came in with George Harrison's mother, and there were so many people who recognized her and were banging on the car." Q: "Doesn't this bother you after a while?" RINGO: (jokingly) "Well, it doesn't bother me if they bang on Mrs. Harrison's car." Q: (laughs) "That's very good. Ringo, thank you very much. Good luck in the concert."